This is a fast, capable Thunderbolt drive that is unnecessarily difficult to set up. As long as you allow time for setup – or have someone else set it up for you – the storage and performance will be worth the effort. One of my BIG frustrations with Thunderbolt as a protocol is that there are so few really high-speed RAIDs – specifically RAID 5’s – available today; almost two years after the protocol was launched! As video editors, we have a huge “need for speed.” And, while two-drive RAID 0’s are nice, they are not sufficient for a lot of video editing. NOTE: This device supports RAID levels 0, 1, 3, 5, 6, 10, 11, 50, 60 and a few others I haven’t heard of. Here’s an article that explains RAID levels. 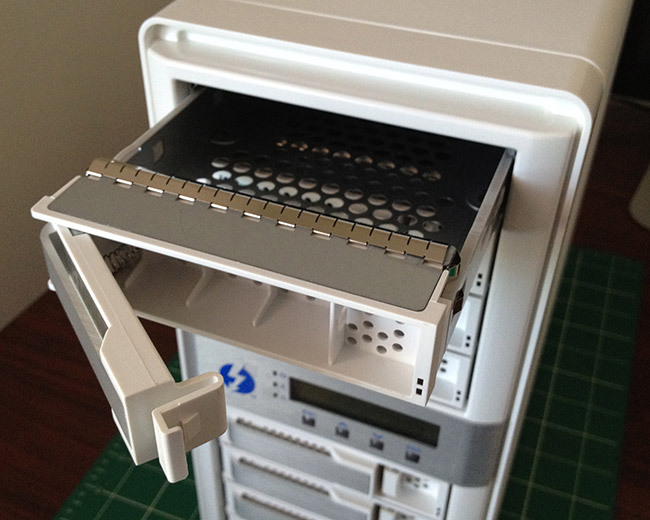 The current workaround is to use a MacPro tower, put in an ESATA, or mini-SAS connector and connect a big, honking enterprise RAID. Which is great if you have a MacPro, but, the last time I checked, there were far more laptops and iMacs doing editing than MacPros and all these systems only support Thunderbolt. NOTE: Yes, I know that ATTO, Sonnet, and others have external interface cards that convert Thunderbolt into a different protocol. But both you and I know this isn’t a solution, its a stop-gap. Areca Technologies is not a company I’ve heard of before. 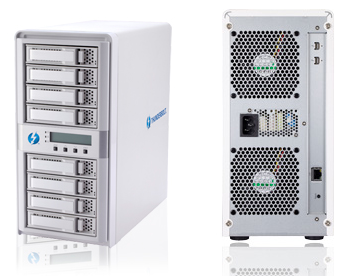 Based in Taiwan and founded in 1999 by engineers they have a wide range of storage products. Shortly before and after Ricardo contacted me, several readers also mentioned this device. So, a couple weeks ago, a unit showed up on my doorstep. Today, I finally had time to put it through its paces. The unit ships with no drives, weighs less than 20 pounds, and is roughly 6-inches by 12-inches by 11-inches. In other words, a nice size to fit comfortably on your desk. The packaging is pretty on the outside and solid on the inside. And, it has a nice looking box. 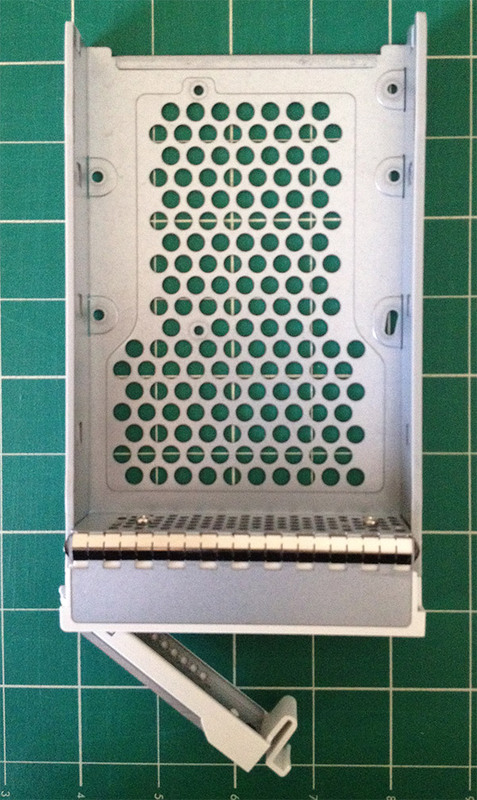 Shipping with the RAID enclosure is a 3-meter Thunderbolt cable, power cable, and Ethernet cable. The enclosure itself is metal, nicely painted and looks like it was put together to be looked at, not hidden away in a rack. NOTE: I am VERY impressed that they shipped a long Thunderbolt cable. This means you can place the unit on the floor, next to your computer, or on your desk without worrying about whether the cable is long enough. While Areca doesn’t have the overtly friendly packaging of a Drobo, it leaves a nice first impression. I laughed as I opened the box, because I realized it didn’t contain any hard drives. (I don’t know why I didn’t expect that, but I didn’t.) So, I went rummaging around my office and found six Seagate 2 TB Barracuda drives that were taking up space, so I used them for my review. BIG NOTE: The Areca holds up to eight drives. However, I only had six available for my review. The more drives any RAID contains, the faster it goes. So, while I’ll do a few speed tests, it isn’t fair to Areca to compare speeds when the unit is not fully populated with drives. Still, even using only six drives, the Areca more than holds its own. SECOND NOTE: The total storage of this device depends upon the drives you use. For example, while eight 2 TB drives would provide about 14 TB in storage, eight 4 TB drives would provide about 28 TB in total storage. THIRD NOTE: Faster RPM drives will provide better performance, but the faster a drive spins the less it holds. I tend to use 7200 RPM drives as a good balance between maximizing performance and storage capacity. 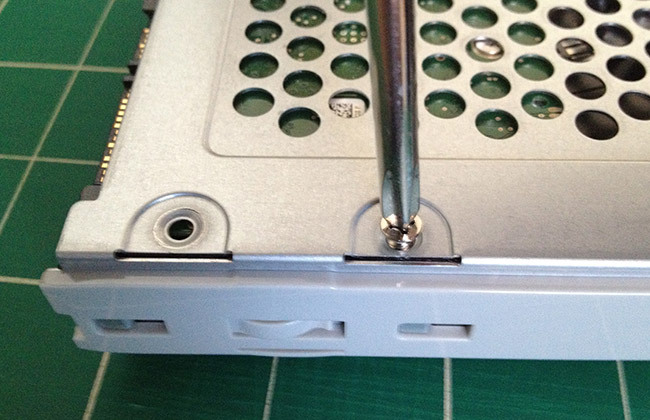 To install a drive, unlatch the drive sled. Put the sled somewhere stable and slide a drive into the sled, with the drive connectors pointing out the back. Then, slide the sled back into the unit and click it to lock. There’s nothing unusual about this procedure – but I should mention that everything about the 8050 has a smooth feel with no sharp edges. Areca was paying attention to the details of its hardware. The three cables connect easily and with no confusion. Once both the power cable and Thunderbolt cables are connected, the system powers up. Lights flash. Fans race. And after about 30 seconds for a self-test, everything settles back down. I was very impressed with how quiet the unit is. Most of the noise was generated by the drives. The Areca has big fans that turn almost silently. However, the drives themselves are noisy enough that I would probably place the RAID a bit away from where I was working. But not too far, the blinking lights are cute and useful. However, all the kind feelings toward Areca disappeared when we got into configuring the drive. I do not know what it is about engineering-driven companies, but they all seem to feel that if you need to read a manual you are clearly unqualified to operate their equipment. Worse, someone forgot to remind management that Macs don’t ship with CDs anymore. Which got me into a real Catch-22: Configuring the drive requires connecting the Ethernet port of my iMac to the RAID, which means that I lost the Internet. However, I needed to go onto the Internet to get the drives. NOTE: There are, apparently, three different ways to configure the unit: using Terminal, using the front panel LCD, and via a web browser using a direct Ethernet connection to the unit. There may be a fourth way by connecting via Thunderbolt, but after reading and re-reading the manual, I have no idea how to access it. Sigh… time to start plugging and unplugging cables. NOTE: The Ethernet connection to the RAID is only needed for configuration. After the RAID is setup, this cable is no longer needed and you can reconnect your computer to the Internet. Downloading the drivers was surprisingly tricky. After you find the 8050 on Areca’s support page, you can’t simply click a link. You need to RIGHT-click the link to download an HTML page, then RIGHT-click the links in that HTML page to download the installers. Installation requires Java, which will be installed automatically if it does not already exist on your system. 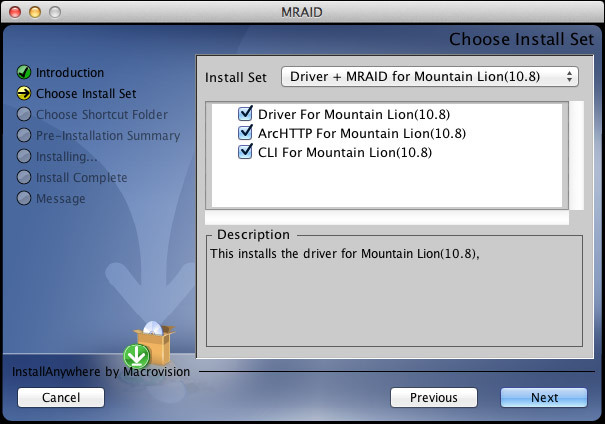 Once you get the drivers downloaded and unzipped, this is the first screen of the installer. I left everything at its default setting, because there’s nothing here that tells me what anything does. Here’s the next screen. For this review I installed to the Desktop, in real-life, as we don’t need this software except for configuration, I would probably just leave it in the Applications folder and not clutter up the Desktop or the Dock. The “Congratulations” page. See if you can spot the problem here. (Right, there is no Done button. Brace yourself, it’s about to get worse.) The total installation took about a minute. 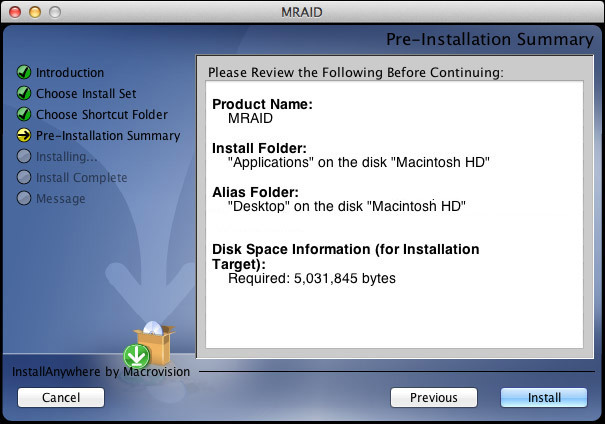 The QuickStart Guide, which is written for both Windows and Mac systems goes on for EIGHT PAGES defining RAIDs. However, the Mac installation instructions are exactly seven lines with no pictures. And the installation instructions are, to be polite, incomplete. Note to Areca: People need CLEAR installation instructions. If they want to learn about RAIDs there are lots of places to do this. Your instructions need to be written by someone who speaks English, understands that new users don’t know anything, and provides copious pictures and pointing arrows. Let me illustrate the problem. 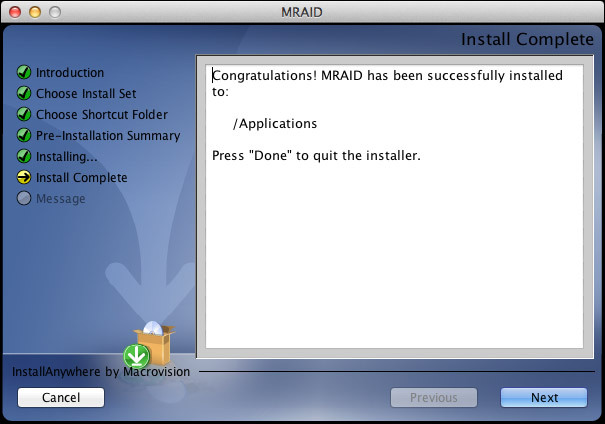 The QuickStart said that the file MRAID would be installed. It wasn’t a file, it was a folder. And here’s what’s inside the folder. Do you have any idea what to click? I didn’t. Does anything suggest itself to you or sound like English? Um, nope. If you are an IT jockey, comfortable with Terminal and happy working at the Command line, you’d select the CLI (Command Line Interface) and go to town. But I’m not an IT pro, most media people are not. WHAT THE HECK ARE WE SUPPOSED TO DO HERE? Sigh… Here’s how this works. A password screen appears. ANOTHER road-block. The QuickStart Guide doesn’t tell us the User Name or Password. THAT is in the User Guide. Which is on the CD. Which I can’t play, Or it’s on the Internet. 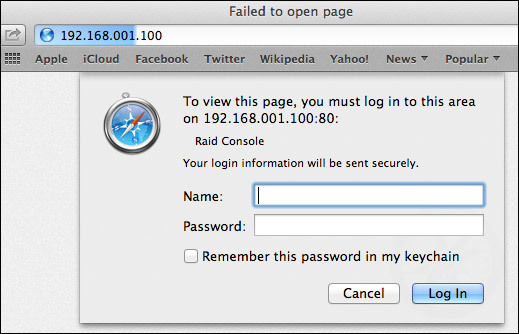 Which I can’t access, because I’m using the Ethernet port to configure the RAID. Off to another computer. Sheesh. NOTE: The bottom two slots are empty because I only had six drives to work with. Not installing the full complement of drives will reduce performance. Here’s how I configured the unit. After clicking Submit, initialization starts. This is not the same as formatting a drive and, actually, takes much longer. Depending upon the size and number of your drives, initialization can take a long time – plan a couple of hours. So don’t expect to buy this RAID and start to use it immediately. Won’t happen. NOTE: I didn’t time it exactly, but it took a bit more than an hour to initialize my six 2 TB drives. More drives, or bigger drives, will take longer. In the “olde days,” I can remember formatting an XRAID with a fraction of the storage of the 8050 and the initialization took about 24 hours. So, things have improved. Now we need to format the drive, using Disk Utility. 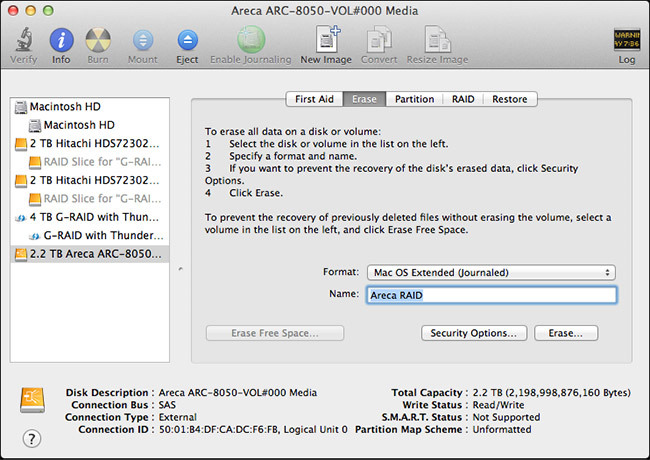 Open disk utility and select the RAID. Set the Format to Mac OS Extended (Journaled) and give it a name. It then asks if you want to use this for Time Machine, say Don’t Use. After just a few seconds, formatting is complete, the drive shows up on the desktop and it is ready to use. For me, between reading the manual, accessing the website, getting lost, and so on; the whole setup, configuration, and initialization process took about three hours. The good news is that you only need to go through this once. Once the drive is set, you never need to do this again. Whew! Now that the drive is running, it acts just like any other drive you’ve ever worked with – only bigger and faster. Much bigger and MUCH faster! It is nice that this has a 2-line LCD on the front for configuration – but, frankly, life is too short to even begin to set up the drive using the minuscule LCD screen. It would be far better for the LCD to display diagnostics, or data rates, or other useful operational data. It may do so, but in reading the QuickStart Guide and skimming the User Manual, there’s no way I can see to do this. I do like the clarity and size of the LCD, but someone needs to think more about the information it displays. Before we get into performance, I want to share some additional thoughts with you. There is no SSD acceleration. The speed of this unit is totally dependent upon the number and speed of the drives it contains. Drives in a RAID need to match for size and speed. If they don’t, during initialization, the RAID will set the size of each drive to match the size of the smallest drive, and the speed of all drives to match the speed of the slowest drive. Traditional RAIDs, like the 8050, don’t allow you to expand the drive by adding more or larger disks, without totally erasing all the drives and starting again. The speed of a RAID-5 is generally the sum of the speed of all drives, less the speed of one drive. The total storage of a RAID-5 is generally the sum of the storage of all drives, less the size of one drive. The reason you buy a Thunderbolt drive is speed, speed and more speed. And this unit delivers. 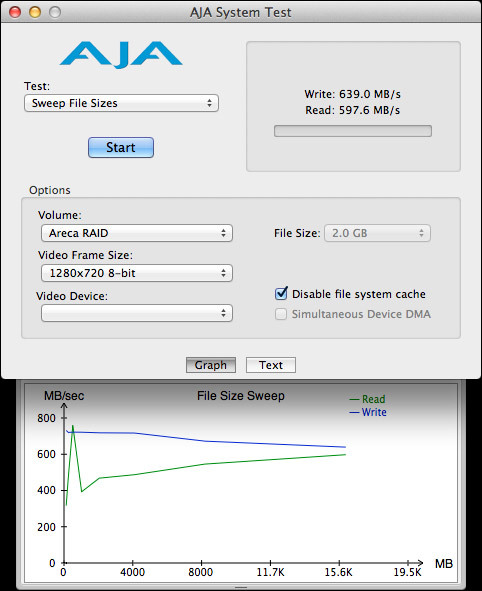 Even with only six drives installed, the write speeds pushed 700 MB/second, which well exceeds USB 3 speeds. With a full complement of eight disks inside, I would expect this to come close to 900 MB/second. At this speed, it almost, but not quite, fills a Thunderbolt channel. Read speeds are slower, but plenty fast enough even for 2K video or aggressive multicam editing. 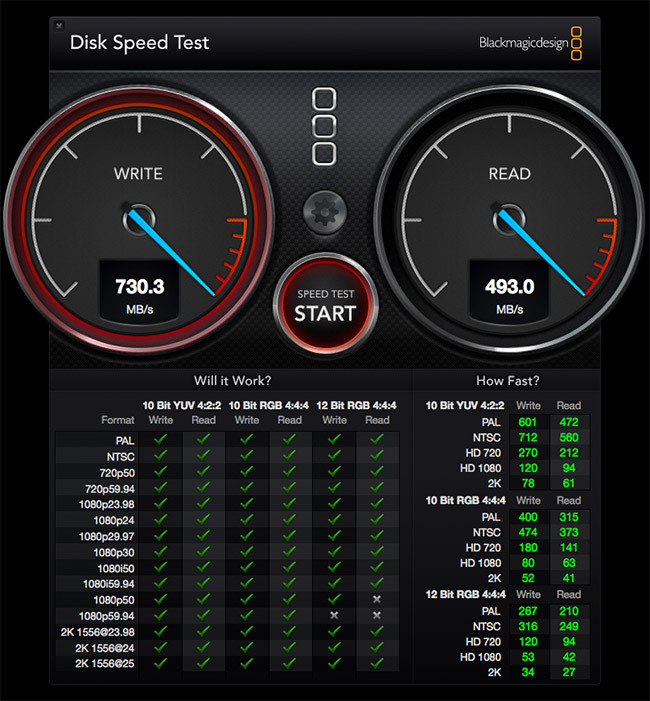 As you can see from the Blackmagic Design Speed Test, the green checks indicate that even with only six drives, this unit is fast enough to support virtually all video formats and workflows. With a full complement of drives, it would easily handle anything you can throw at it. NOTE: For multicam work, I recommend using proxy files for the basic edit, then convert to optimized media for fine tuning. At these speeds, the Areca would handle 64 cameras at proxy resolution (which is the maximum number of multicam streams that FCP X supports) and 25 cameras at ProRes 422 quality. For the purposes of calculation, assume a proxy video stream is 6 MB/second, while a ProRes 422 stream is 18 MB/second. I was testing this system on my new iMac, which I use for editing. Normally, I use a 2-drive G-Technology RAID as my data disk. So, I decided to copy files from the G-Tech to the Areca. As you can see, I’m copying more than 80,000 files requiring 2.12 TB of storage. And, while the G-Tech was working as hard as it could, delivering data around 260 MB/second, the Areca was barely breaking a sweat, easily handling the data files without maxing out its drives, or the Thunderbolt channel. However, something interesting I noticed was that when I duplicated files that were stored on the Areca, the speed of duplication was less than 200 MB/second. I’m not sure why this was so slow. This is not a bad number, simply lower than I would expect. Spend MUCH less time talking about RAIDs and more going step-by-step through configure and install. The QuickStart is about setup, not theory. In the QuickStart, provide accurate screen shots, much more detailed step-by-step instructions and explain that it will take hours to initialize a RAID set. Add a much better description of RAID sets and the fact that once configured you can’t change them. Provide a recommendation of what RAID set is a good general choice. Make the download section of website MUCH clearer for people that just want access to the Thunderbolt RAID instructions and drivers. Your support site needs a lot of work. Or put both the manuals and drivers on the sales page. Everything is way too hard to find. Spend time proof-reading your QuickStart and User Guides to remove typos, fix bad English, and make sure all instructions are accurate. Once you get past the installation, the Areca 8050 is everything you want in a Thunderbolt drive: fast, quiet, fast, easy-to-use, and fast! It has speed to spare. But the installation is not for the faint of heart. If working with hardware makes you nervous, buy this through a dealer and make sure they configure it for you before delivery. If you are setting this up yourself, allow extra time to puzzle out what the instructions REALLY mean. Then, re-read this article to pick up the pieces that Areca forgot to include. I’ve been waiting a long time for a RAID 5 Thunderbolt drive. Once you get it setup, you’ll discover that with the Areca 8050, it’s here. Couple of comments I meant to put in a while back. Current units do HAVE a power button. It is a soft button as the unit normally follows the power of the computer driving the Thunderbolt bus. But you can turn the unit on or off by holding the button down for 5 to 10 seconds. Second, you do NOT need to directly connect the unit to a computer to configure it. You can just connect it to your local network and it will try and pull an IP from your DHCP server. (Most every local network has a DHCP server even if you don’t realize it is there.) And if it does not get an IP from a DHCP server it will still generate an IP address. The IP address of the unit is shown on the front panel and you can then just type that into your browser and configure the unit without needing to install any software. I’ve set up 3 of these and they work great. 2 primarily with SSDs in a RAID setup with the other drives slots as pass through drives and the latest one with 8 3TB WD RED drives in a RAID 6 for 18TB of usable space. We were a bit concerned about the life of SSDs in a RAID 5 or 6 setup but after 21 months it appears we have only used about 1/40 of the life of the SSDs. These are Samsung EVO 1TB drives. I try to initialize my ARC-5026 – volume state : 4% within 24h, looks not good? Well, to be fair, I use 4 x 8TB Seagate Archive drives. Reinitializing a hardware RAID at the hardware level can take days – I once took five days to initialize a 2 TB RAID. However, you may be experiencing excessive delays. Contact the support folks at Areca and see what they suggest. But it´s not a problem, that I took the Seagate 8TB Archive disc`s – just the data 8TB makes it that long – right. So frustrated with ARECA. Bought a ARC-5026 and 4 6tb HGST drives to use with my Mac Pro (El Capitan). Initialized with arcHTTP64 in RAID1+0. Took roughly 12 hours. But now I can’t use the drive. When I go to disk utility, partition is grayed out. I tried doing the erase as you showed on your review, but nothing happens. It just sits there. 4 days later (long weekend), still nothing had happened. I deleted the RAID set and started over, but got the exact same result. I’ve emailed (a week ago!) and messaged ARECA, but no response. Ridiculous. I’m sorry for all your problems. I’m hoping Areca calls back quickly with a solution to your problem. THANK YOU SOOO MUCH FOR THIS! You’ve save me and countless Areca owners hours of frustration. Feel great that you’re helping a lot of people. Cheers! Larry! Im so glad i found your site and in particular, this easy to understand review. I have a question I’m hoping you can help me with. I just got the 8050T2 and i put in 2 NAS 6TB drives ( adding another 2 later ) and i have the unit connected to my macbook pro, and have the ethernet cable connected to my router. Well, nothing happened. nothing comes up. dO you have any idea why this would happen? You’ll probably need to contact Areca support for this, but my first guess is that the RAID and your laptop are on different subnets. Re-read the review and you’ll see that you need to connect your Ethernet cable to the RAID, not your router. That puts both devices on the same subnet. At this point, you should be able to configure the device. Fantastic Review. Have you encountered/heard of any compatibility issues, or would suspect of any by using the ARC-8050T2 with WD RED PRO 6TB drives? Thanks in advance for your attention. I’m not the best source for this information. You are far better off contacting Areca support directly. They will know which devices it supports and which it doesn’t. I have an Areca 5026, similar in build to this 8 bay (another great review, btw). Recently a red flashing light indicated that a drive failure in my RAID5 — no problem — but in trying to remove the drive, the tray seems to be stuck. It’s just physically not budging past the point where the latch extends about 30º out. Not wanting to break the tray’s plastic façade, I’ve left it alone and am seeking any advice you may have. I’ve always appreciated the detail you’ve taken in reporting on the build quality and how things fit together. While waiting for a likely generic and less-than-helpful response from the mfr, I’m hoping based on your experience you might have a tip to share for removal of overly snug drives/trays, particulary of the Areca kind. Many thanks in advance, and some belated thanks, as you’ve already done a great deal to help me in terms of my video editing career path. When it comes to a technical issue of this detail, the manufacturer is your best solution. They are intimately familiar with their gear and will have a workaround or solution. Contact them directly and, if they don’t respond, let me know and I’ll wave the flag on your behalf. Long time Areca user here, probably 10 years. Great Raid hardware, yes tough to come to terms with setup first time around, but once you do, it’s fine from there on. 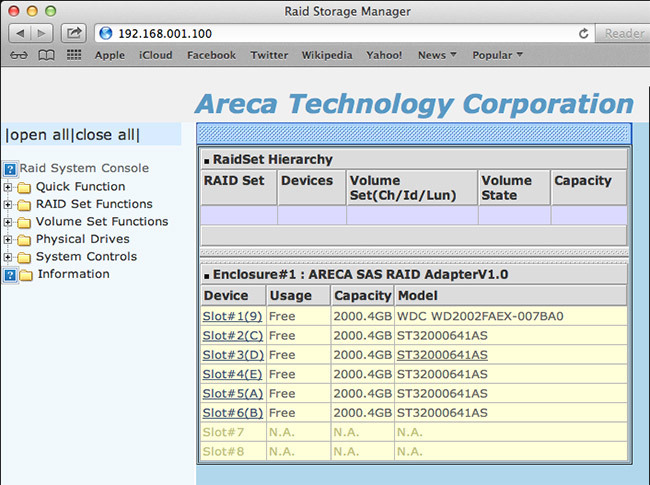 I have internal 7x6tb in Raid 5 (Areca 1220 card) and two 8050s externally for backup. One offsite. Note firstly you initialise the array, then make a ‘volume’ which can simply be one single massive drive or divide the array into 2, 4, 8 whatever volumes. Most of us just use 1 giant volume. I use Raid 5 or 6, mostly. there seems little speed difference, to be honest. Much bigger effect is how full your array is. It starts to slow down a bit as you get above 75%. Something nice is that arrays can be swapped about and pulled in:out from internal to external – they all work same. A tip: buy HGST (Hitachi) drives if you can – easily the most reliable (see online tests) I use 6tb HGST drives mostly 7200rpm. No problems for years. About $210 each currently. Note there is a new model out now – the T3 range with Thunderbolt 3, and more importantly, a faster dual processor board. It may be worth getting, unless they heavily discount the older T2. My one complaint (besides the poor user interface everyone mentions) is that drive sleds are not available cheaply and easily. 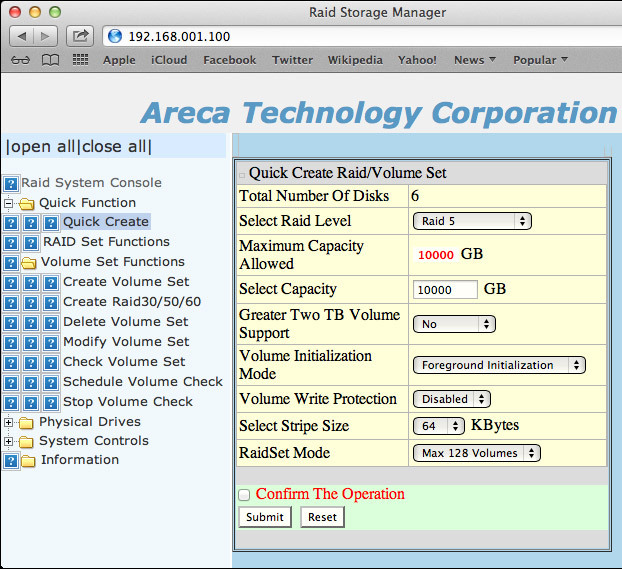 You should be able to slide other raid arrays in:out of the unit as needed, but they are a silly price from Areca, when really they should be no more than $15 or so each. But just to affirm – these are serious super fast pro Raid systems, not some weak Drobo-like system for light users. As such you should expect a little less hand holding, but get class leading results once you are there! Thanks for taking the time to write this. I find your comments to be very helpful. Hey Larry, quick question, when using disk utility, is it possible to format the raid to Exfat instead and possibly use it on both windows and Mac or is that not possible. I have two editing stations and it would be great to just plug in and go on the 8050 on both machines rather than copying to other drives like I currently do. I no longer have this RAID in-house to test, but, in general, yes. Depending upon the RAID controller and its software you should be able to format a RAID to either HFS+ or ExFAT. I am really glad I found this post! I have been using an ARC 8050 (running RAID 6) for storage of high resolution still photos. It has been trouble free since I first set it up in January 2015. It is being run from my Mac Pro. For the initial set-up I used six WD SE Datacenter 4TB drives (7200 RPM) with the thought that I could expand at a later date. Those drives are no longer available so I contacted Areca and was directed to the list of certified replacements. I ordered two WD Gold 4TB drives (which have the same 7200 RPM). I also asked about the procedure of adding drives. The response was “you can use expande raidset feature to expande a raidset and use modify volume feature if you would like to expande the volume capacity after raidset expansion completed. or you can create another volume with the new added capacity”. Though a bit cryptic I thought I was good to go until I read in your DRIVE NOTES “Traditional RAIDs, like the 8050, don’t allow you to expand the drive by adding more or larger disks, without totally erasing all the drives and starting again” WOAH!!! So my question. Am I SOL or has anything changed since your original post that would allow me to add the additional drives without damage to the already stored files? If not the only workaround I can think of would be to load all the files onto a separate drive, add the two drives, re-format all 8 drives and then reload all the files. Is there something I am not thinking of? It depends upon the software the RAID is using. Generally, you can’t expand a RAID without copying everything off, rebuilding the RAID, then copying everything off. You CAN add drives into empty slots and create new volumes easily. I would believe what Areca tells you, as they know their software best. BUT… I would ask for instructions clear enough for you to feel comfortable doing the work. Cryptic instructions leads to catastrophe. And, the standard caveat applies: when messing with the structure of any hard disk, backup all your data first. Good advice and confirms the direction I was heading. Thanks!